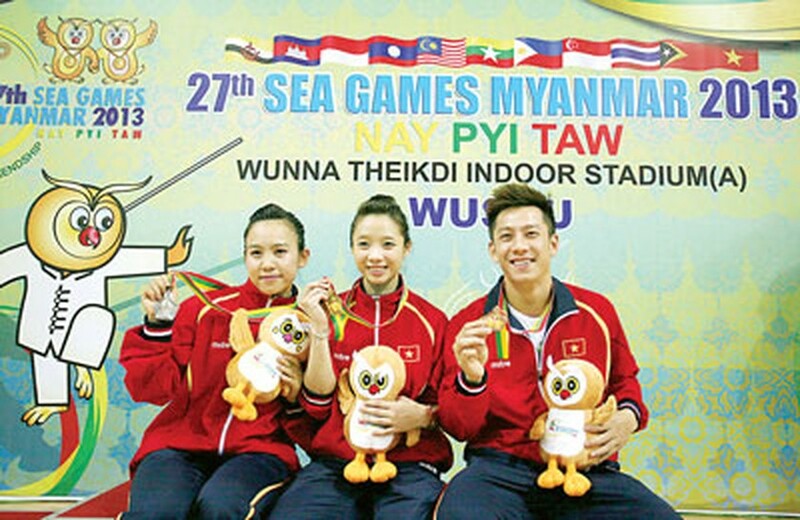 Vietnamese wushu athlete Duong Thuy Vi on December 7 defeated her Burmese competitor Sandy Oo by 0.01 points in the women’s Taolu Jianshu event to win the first gold medal for Vietnam at the 27th SEA Games. Despite injuries during her first practice after arriving in Myanmar, Vi did her Taolu Jianshu performance excellently to nail the first gold medal with 9.70 points for the Vietnamese wushu team, and bring glory for her country. Meanwhile, Bui Minh Phuong won the silver medal in the women’s Nanquan event and Tran Xuan Hiep, the current world champion, only managed to win a bronze medal in the men’s Taolu Changquan event. On the same day, Sanshou athletes also started their competition. With five athletes participating in the event, except Phan Thanh Thang in 52-kilogram weight division who was eliminated by a Thai athlete, Vietnamese athletes, namely Hoang Van Cao, Ngo Van Bau, Nguyen Thi Chinh, and Nguyen Thu Hoai, have entered the next round of the Sanshou event.